In two days I’ll legally be an adult. I welcome adulthood for one primary reason, and that reason is independence. Yes, as much as I’d love to lament over how much easier life was when I could just sit around and play Pokemon for days and days and as much as I am lazy with a few of my responsibilities at times I’m sincerely glad that I can finally enter the adult world because once I’m there I feel I can fully count myself an individual. The reason why that’s so important to me is because I’m a twin, and growing up it’s fair to say I’ve been treated by many as a novelty, as less than individual. From patronising “which one is the evil twin” jokes from peers to taunting from elder siblings that still goes on to this day, there are a lot of ways to go about belittling a twin and I’ve probably experienced them all. Besides the very odd conversations I’ve had with other twins there aren’t too many people I’ve met who are willing to actually discuss the issue, and that’s simply because they can’t relate to it. Mind you, this is no pity party. I would undoubtedly deem myself a big optimist and believe, all things considered, that I am a happy person, but the treatment I get from others as a twin has most certainly been a thorn in my side that’s done damage to my self-esteem for years. Suffice to say that I believe a whole lot of media portray twins in a less than flattering light. They’re used as a novelty in entertainment and art alike, which has also been quite unsettling. It seems to me that many, many people who haven’t walked a mile in the shoes of a twin really don’t care to acknowledge them as true individuals. At the absolute least it’s annoying, and at worst it can be disheartening. Since just before my 15th birthday I’ve started to go down a drastically different path as an individual as my brother because I got myself involved in internet communities that had a significant influence on me. Since then I’ve added to the minimal differences of appearance and what game console we fanboy over by developing the way I walk, the way I talk, the way I interact with others and my own ideals and mentalities in a very different way to him. I know deep down these days more than ever that I’m an individual. That’s 400 words about myself, now on to Gravity Falls. Gravity Falls is one of those rare pieces of media that really understands how twins function and interact as two individuals who have grown up under the same circumstances but have ultimately become more and more individual as minor differences in circumstance have caused them to change in unique ways. Alex Hirsch, creator of Gravity Falls, is a twin himself. Having a twin sister, he understands that difference even more clearly than I do having a twin brother. He show this through the two protagonists of Gravity Falls, the comically awkward but good-willed Dipper Pines and his adorably hyperactive brace-faced sister Mabel Pines. Dipper and Mabel have a very tight-knit relationship, certainly tighter than the one I have with my brother, but they’ve got obstacles to overcome. They’re both 12 years old spending their summer break with their morally bankrupt Great Uncle at the wacky and weird Gravity Falls, and they’re both on the verge of adolescence becoming increasingly hormonal. This is particularly true for Dipper, who becomes deeply infatuated with 15 year old Wendy during the break and concerned with trying to look masculine to impress her, much to the chagrin of her on and off boyfriend Robbie V., a short tempered angsty punk rocker the same age as her. Mabel also has her own infatuations, though she’s incredibly fickle and clueless about it (granted she has more success than Dipper as she’s far more often the object of affection), as well as her own rival in manipulative popular girl Pacifica Northwest. The further Mabel and Dipper pursue their own distinct ideals the more individual they become. This is probably most evident in the differences of conflict in episodes 11 and 12. Episode 11, ‘Little Dipper’, characterises one of the simpler nuances of being a twin, that is jealousy of one twin being better than the other twin at something. I’m very much in Dipper’s shoes with this episode as the arguably more talented twin. I was always better at school across pretty much every single subject when compared to my brother, particularly more fundamental subjects like English and Mathematics. As it is now, I also have a much more clear career objective than him. With that considered, I’m not always better at absolutely everything, and to this day I still feel uncomfortable with the thought of my brother besting me at anything. Just recently I’m pretty sure he surpassed my skill at Pro Wrestling video games. Though I can’t be certain because I’ve messed around the last several times we’ve gone plain old 1 on 1, the thought that he might just be better than me at something is genuinely discomforting. I’ve had that feeling in other situations, like when I was told at age 14 by a peer that they liked my brother better than me. He wasn’t a very reliable person to make such a judgment, but even then it still stung. I wouldn’t feel very comfortable typing those stories out if I didn’t have those excuses to go with them, that’s how much it pains me to ever admit that I’m inferior with anything. Petty as it is, it’s how you think when you’ve grown up in the exact same environment with someone the exact same age as you who’s 99.96% biologically related. 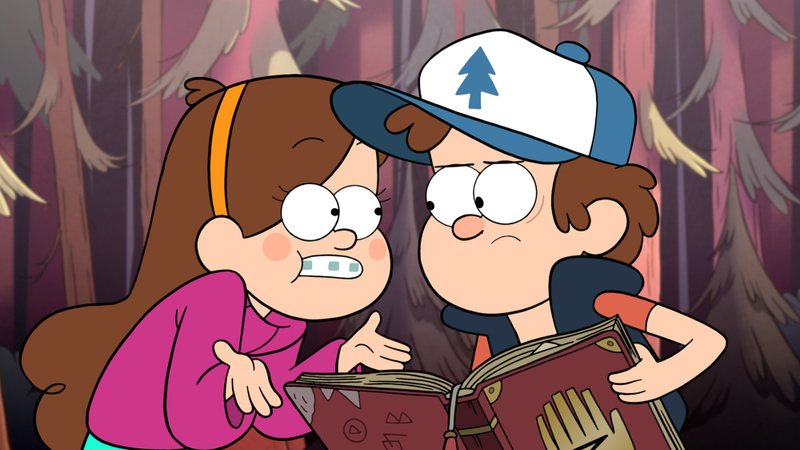 Apparently the same goes for nonidentical twins like Dipper and Mabel. 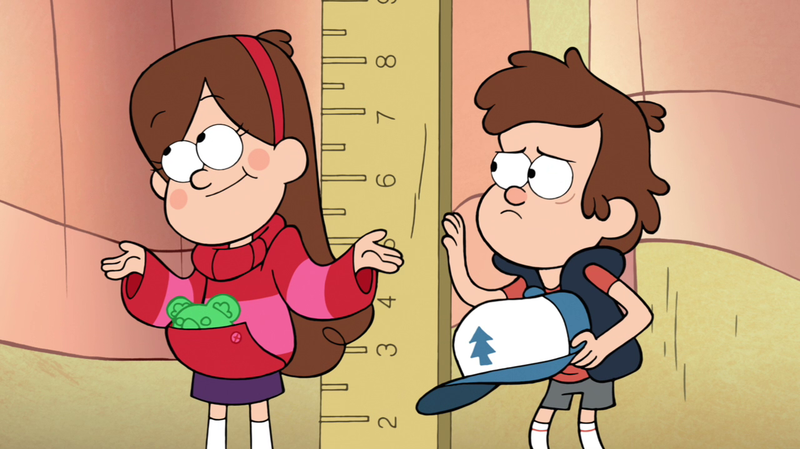 Dipper goes into a fit of jealous rage after he finds himself to be a half-inch shorter than Mabel followed by Mabel rubbing it in his face by repeatedly chanting that she’s the “alpha twin”. It’s later revealed by Mabel that she acted that way because she had grown jealous of Dipper’s notably vaster array of superior skills. Though I don’t relate to Dipper’s fit of rage or the subsequent conflict involving a size manipulator and main antagonist Li’l Gideon (which is pretty awesome, by the way), I relate strongly to both the specific scenario and the emotions. This is very much the kind of conflict twins have, particularly at a younger age. Episode 12, ‘Summerween’, is the first clear establishment of the growing distance between them as adolescents with different desires. Dipper wants to go to a party with Wendy to impress her and to one-up Robbie V. . 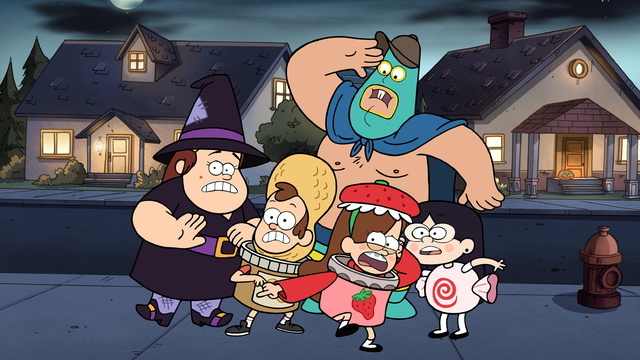 The problem with that is the fact that Halloween every year is one of the significant bonding experiences that happens between Dipper and Mabel as they exploit people’s fascination with twins as a novelty for lots and lots of candy. Mabel knows that their childhood is coming to an end and that they don’t have too many more Halloweens/Summerweens to trick-or-treat for, whereas Dipper seems intent to waste the rest of his childhood on his adolescent whims. After yet another awesome supernatural conflict, this time involving a monster made out of rejected knock-off candy that eventually gets eaten by everyone’s favourite lovable oaf Soos, Dipper comes to realise how he should cherish his remaining moments of childhood even amongst the transition into adolescence. Once those last few moments are over Dipper and Mabel will inevitably become more distant and individual, a sad fact considering how much fun they are together. The episodes following start to show more of that adolescent side to Dipper and Mabel, particularly Mabel who hadn’t previously shown it much, as we see her become deeply infatuated with a Spanish merman as well as rescue a literally genetically engineered boy band among other things. As I’m now finishing my journey, Dipper and Mabel are just beginning to follow the path of developing true individual identity as a twin. And there’s one reason I love Gravity Falls. It’s one of those very rare pieces of media that richly and respectfully characterises twins as individuals as it comes from a perspective that grasps its own personal experiences of such things. I identify with the experiences of both creator Alex Hirsch and the main characters Dipper and Mabel, and due to that I have a perspective that allows me to vouch for the nuance of that aspect of characterisation. I could go on about many, many wonderful things that I love about Gravity Falls from its characters in a broader sense to its sense of humour to its rich sense of imagination, but to me personally I feel the very best part of all is its resonance with me as a twin. Next ›Bristle’s Babbles #21: What’s The Deal With Scores?